We decided that this itinerary would go best with overnight stays in small, peaceful and quiet island places. After a bike tour, you can enjoy a maximum of relaxation, sipping a drink or just chilling on deck. In certain cases it might happen that your captain chooses another overnight port than described in this itinerary (e.g. due to weather conditions). 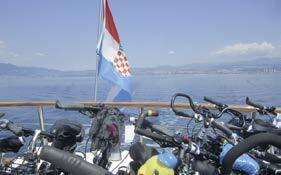 From 11:30 am to 1:00 pm, boarding time in the port of Zadar, our bicycles are awaiting you already in front of the boat. If you arrive by your own car, you can proceed to the port already from 10:00 am and unload your luggage. Our serviceteam will show you the parking lot where you can leave your car. After embarkation, our representatives and guides will welcome you aboard with a drink and you will meet the crew and your fellow passengers. 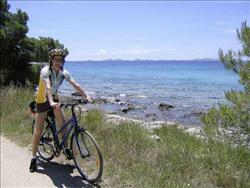 After a lunch snack, we will take our bikes and discover the Riviera of Zadar. From Zadar we will continue through Kožino, Petrčane, and Zaton to Nin. Nin, located on a small island and connected by two bridges to the mainland, was once the seat of Croatian Bishops and at times even the royal city. Particularly noteworthy is the church of Sv. Kriz (the Holy Cross) dating back to the 11th century, also known as “the smallest cathedral in the world”. After a break, we will continue our tour heading to the port of Vir, on the homonymous island, which is connected to the mainland by a bridge. Dinner on board and overnight stay in Vir (29.6 km by bike). After breakfast, we head to the island of Molat. After having enjoyed lunch on board, we will cycle from the fishing village of Molat to the village of Zapuntel and return by the same route back to our vessel. In the afternoon, there will be plenty of time to enjoy a swim, before the boat takes us to the island of Zverinac. Dinner and overnight stay in Zverinac (18.5 km). 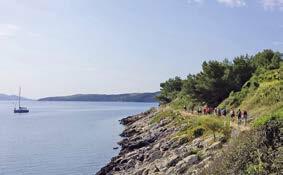 After breakfast, we weigh anchor and cross over to Božava on the island of Dugi Otok. The island is called “Long Island” for a good reason – it is about 44 km long and in some parts only a few hundred metres wide. 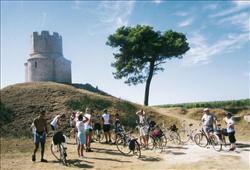 We unload the bikes and ride to the lighthouse of Veli Rat, which marks the north-western end of the island. We can have lunch in a restaurant in Veli Rat or Verunić, before continuing our tour via Božava and Dragove to Brbinj. Afterwards, we will sail for the Island of Rava. Dinner and overnight stay in the small port of Rava (31 km). Today, we will first sail to Sali, the capital and administrative centre of the island of Dugi Otok. 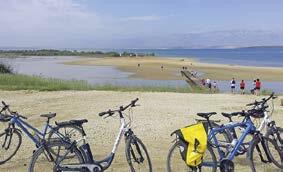 Starting from Sali, we will do a bike tour to the Nature Park Telašćica and back to Sali. 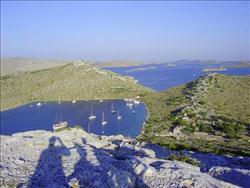 Afterwards, we will head to the Kornati Islands National Park while having lunch on board. Enjoy the peace and quiet of the 125 mostly uninhabited islands and islets of the National Park, where we will stop for swimming and sunbathing before continuing to our next port of call. After four to five hours, we will reach Šibenik, where we will enjoy a sightseeing tour. Afterwards, you will have the opportunity to visit a restaurant for dinner. Overnight stay in Šibenik (18.6 km). After breakfast, we will head upstream on the Krka river and moor in Skradin, just before the famous Krka waterfalls. 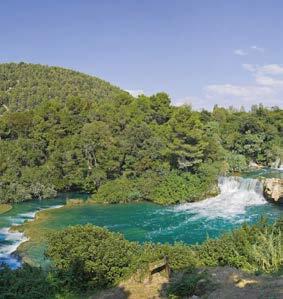 Our today’s first bike tour will take us to “Skradinski Buk”, the best known part of the waterfalls, where on a distance of 800 m the Krka river falls in 17 waterfalls and cascades – which are up to 100 m wide – 46 m into the depth. After a short stay at the area of the waterfalls, we will ride back to Skradin, to have lunch on board before continuing our cruise to the small port of Martinska. 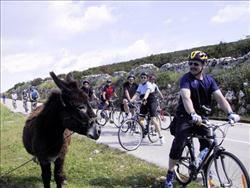 From Martinska, we will go by bike to the popular summer resort Vodice. Opportunity to visit a restaurant for dinner and overnight stay in Vodice (8.9 and 11.4 km). 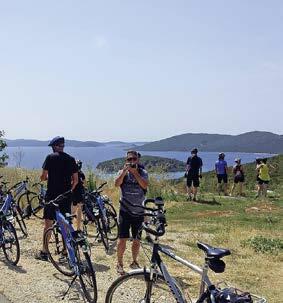 Today we will discover the coast and its numerous offshore islets – from Vodice, we will ride to the vantage point “Okit”, continuing via Tribunj and Sovlje to Tisno, where a bridge will lead us to the island of Murter. There we will enjoy a tour around the island – passing Lovišća, Plitka Vala, Betina and Murter we will reach the Podvrške bay. By the way, the small village of Betina is considered the centre of traditional timber shipbuilding, where still today boats are hand-crafted in small private shipyards. On our way we will have lunch in one of the island villages. Captain’s dinner on board and overnight stay in the bay of Podvrške in the vicinity of the fishermen’s village Murter (33.7 km). During breakfast, we will head towards Tkon on the island of Pašman. Today we will “conquer” two islands – Pašman and Ugljan. From Tkon we will ride over Pašman, Neviđane, Dobropoljana and Ždrelac to the bridge that connects the two islands, continuing via Kali to Preko. At lunchtime, we will reach Preko, where we will have lunch on board, before heading to a nearby bay for a last refreshing dip. After having had plenty of time for swimming and sunbathing, we will set off for Zadar, where our guide is already waiting to take us on a tour through the historic town with its impressive surrounding walls and many more other interesting sights and secrets to discover. Afterwards you can take the opportunity to enjoy dinner in one of the numerous restaurants. 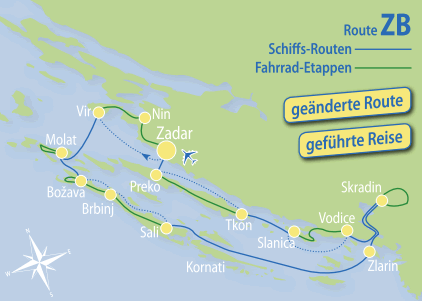 Overnight stay in Zadar (30.2 km).